> just dreaming about) wanting to be a DN, it would be: buy a plane ticket! This is advice for if you want to a digital nomad next week. 1) Get experience earning money in a location independent way (you can do that where you live more easily than anywhere else). 2) Save up some money. This item most people will skip but it is helpful. It can be hard for many people to do. And if you don’t want to you can do well without saving much. But you do increase the risks of running into money problems that you could have smoothed over with savings. 3) Travel to where you would like to be a nomad for a trial run. If you want to do it in SE Asia take some time visiting and seeing what it is like. 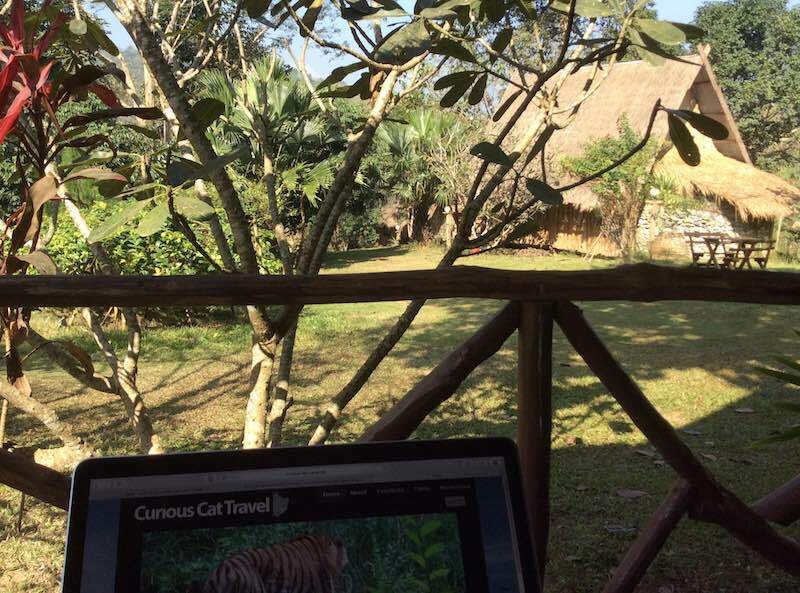 Travel in the way you plan to as a digital nomad. Don’t stay in nice hotels if your digital nomad plan is to live cheaply. As with all this advice you can ignore the particular advice and learn from even just doing part of it (visiting but staying in much nicer places and being just a tourist will tell you more than never going at all), but doing more will prepare you better (and let you learn if it is what you really want to do). Some might require extra steps, maybe to earn location independent money you will need to learn a new skill, and maybe need to gain experience etc..
View from my porch in Luang Prabang, Laos. This was a great place to work (not my average location to work, one of my favorites). I tethered my laptop to my cell phone connection which was fine (you could stream video), it did fail for about 20 hours over 2 days but otherwise was good. Just leaving on a jet plane tomorrow does work for some people. But I think there are many more people it doesn’t work for than it would work for. And truthfully many people don’t want to take the time to do a thorough job of the 3 steps I mention. You don’t have to do a thorough job if you don’t want, but it will give you a better chance to succeed and enjoy your experience. There are also many other sensible things to do first: learn about visa rules, pack well, deal with things like health insurance, deal with mail (family, friend or service) – you often need a physical address at home for some things, find good sources or information on living as a digital nomad, figure out how you will handle banking (it can be a real pain to find an international business bank as a digital nomad), and on and on. You can read about these things on my post here and in some posts on my Curious Cat Travel Destinations blog and many other good blogs. This entry was posted in money, Personal Finance and tagged digital nomad, lifestyle, tips by money. Bookmark the permalink.